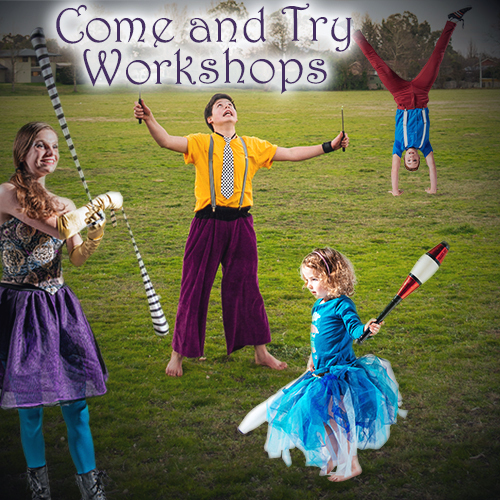 Come and Try Workshops are full of exciting and fun circus activities for all ages and skill levels. There will a range of handheld circus activities (‘manipulations’) including juggling, diabolo, trick sticks, hula hoop, poi, plate spinning and more! Open ‘come and try’ workshops are suitable for all ages. Attendees can join in at any time throughout the workshop, try one thing or stay all day! Our trainers are there to supervise activities and give basic instructions on how to get circus-ing! After you get exhausted, you can refill some energy at our BBQ stall! Our venue for this is Kaleen High School. No registration required and they are all free of charge! As a special fundraiser, for the first time ever, Warehouse Circus will be opening up the Flying Trapeze rig to participants for workshops and single flies throughout the day! If you would like to book in for a Beginners Flying Trapeze Workshop for $50 between 10am and 11:30am on both days, click on the button below.